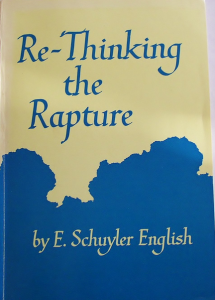 In a recent series of messages on the rapture, I reread this small book by Dr. English and again appreciated his insight and graciousness on the subject. As our pre-tribulational view of the rapture has fallen out of favor with some, we will do well to bring great books like this back to the fore. This volume is well-known for its view that the “falling away” in 2 Thes. 2:3 is the “departure” of the saints before the tribulation. I think the volume should also be known for its gracious but solid rebuttal of the opposing views, especially the last chapter on the partial rapture view. Dr. English was the chairman of the revision committee for the New Scofield Reference Bible; he succeeded A.C. Gaebelein as editor of Our hope magazine; was biographer for H.A. Ironside and R.G. Lee; and also published Things Surely To Be Believed and Studies in the Epistle to the Hebrews.